Following a Facebook fortune-funded teacher bonus plan, Newark teachers elected an incumbent president who supports a recent “performance bonus’ for ‘peer review’ plan, and an executive board mostly opposed to it. Eight months after negotiating “performance bonuses” funded by a Facebook fortune, Newark Teachers Union President Joseph Del Grosso was re-elected Tuesday by a margin of nine votes. A challenger slate that’s drawn inspiration from the Chicago Teachers Union captured seventeen of the twenty-nine seats on the NTU’s executive board, while barely falling short in its bid to oust Del Grosso. The new and old union officers will be sworn in together this afternoon, setting the stage for further conflict over the union’s orientation towards a nationally ascendant education reform agenda. Under the agreement, management agreed to have a portion of teachers’ evaluations be based on “peer review” by other teachers; the union agreed to have a portion of teachers’ compensation come in the form of bonuses distributed based on their evaluations. The bonuses will be paid for from a $100 million fund donated by Facebook founder Mark Zuckerberg in 2010, a high-profile example of the influence a wealthy philanthropist can wield with donations to a cash-strapped school system. Under a 2012 law signed by Christie and supported by NTU, Newark schools will be required to include testing in evaluations. NEW Caucus’s Rippey described a requirement that student test scores make up 35 percent of evaluations next year as “brutal,” and “like suicide for teachers in an urban district with 32 percent child poverty.” Del Grosso told The Nation that he was hopeful that the state education board would scale back the role of testing in evaluations. He said last fall that he agreed to support the law—which also makes it easier to fire teachers who receive poor evaluations—on the condition that it offer the option for union contracts to implement peer review. Tuesday’s NTU election follows April’s leadership election in the AFT’s largest local, New York’s United Federation of Teachers. In both cases, incumbents survived challenges from caucuses demanding more aggressive opposition to the mainstream “education reform” agenda backed by billionaires like Zuckerberg. 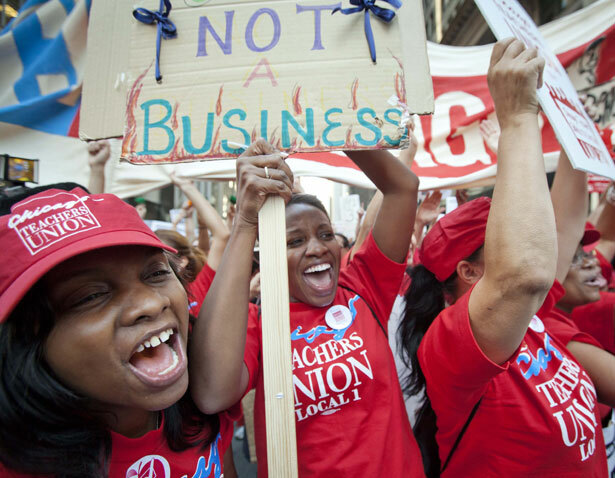 Both Newark’s NEW Caucus and New York’s MORE Caucus have taken inspiration from the Congress of Rank and File Educators, a caucus that seized control of the Chicago Teachers Union in a 2010 election and then mounted last summer’s week-long strike. After Walmart fired a group of striking workers, Congressman Alan Grayson announced a bill to let workers sue bosses who retaliate against their organizing efforts.